Washington, Oct 31 (IANS) US Defence Secretary James Mattis and Secretary of State Rex Tillerson laid out conditions that they want Congress to follow should it pass a new war authorization, the media reported. 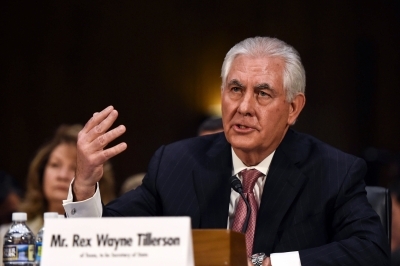 On Monday, Tillerson and Mattis said a new war authorization should not have time or geographic constraints. They also said the 2001 Authorization for Use of Military Force (AUMF) Act should not be repealed until a replacement was in place, reports The Hill magazine. The AUMF “remains a cornerstone for ongoing US military operations and continues to provide legal authority relied upon to defeat this threat”, Tillerson said. Under the US Constitution, only Congress has the power to declare war. Mattis added that 2001 AUMF, as well as the 2002 AUMF, “remain a sound basis for ongoing US military operations” but that “any new congressional expression of unity, whether or not an AUMF, would present a strong statement to the world of America’s determination”, The Hill reported. President Donald Trump’s administration relies on the 2001 AUMF for legal authority in the war against the Islamic State, as did the previous Barack Obama’s administration. The 2001 AUMF authorized military actions against Al Qaeda, Taliban and other perpetrators of the September 11, 2001, terrorist attacks. Mattis and Tillerson were testifying amid scrutiny of the extent of US military operations following the deaths earlier this month of four American soldiers in an ambush in Niger.